Detroit is a comedy drama that looks at life in the American suburbs. Playwright Lisa D’Amour addresses series issues in this show, but does so in an entertaining and engaging manner. The play is suitable for adults and teenagers, but not for younger children due to the nature of its themes. 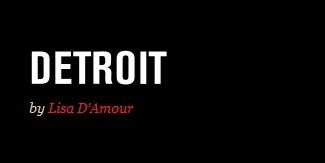 Detroit is a play by American writer, Lisa D’Amour, which premiered at the Steppenwolf Theatre in Chicago in 2010. It is due to open in New York later this year, initially at an off-Broadway venue. Tickets are now available to book online and at the box office. The Chicago run of Detroit took place from September to November 2010 and it was staged by the Steppenwolf Theatre Company, one of America’s leading regional theatre ensembles. The director of the Chicago production was Austin Pendleton and the principal parts were played by Kevin Anderson, Kate Arrington, Laurie Metcalf, Robert Breuler and Ian Barford. Lisa D’Amour is an up and coming young writer and former actor and pageant queen. Her play Nita and Zita won an Obie Award in 2003. Detroit is due to open at the Playwrights Horizons theatre during the second half of 2012 after which it is hoped that the production will move to Broadway. The director for this new production is Anne Kauffman, previously an Obie Award winner. The lead roles have not yet been cast. Playwrights Horizons is located on 42nd Street and specialises in productions of contemporary American writing. Tickets for Detroit are now available and bookings can be made online. What is Detroit the musical about? Detroit is a comic drama that attempts to show the vulnerable under-belly of the American Dream. It concerns the relationship between Ben and Mary, a seemingly typical lower middle-class suburban couple, and a new couple, Kenny and Karen, who move in next door. Ben and Mary invite their new neighbours around for a barbecue but, from an initially harmonious relationship, things begin to spiral out of control with surprising results. In her play Detroit Lisa D’Amour presents a searing critique of the fragility of middle class, suburban values. However, she manages to do so with moments of humour and with great affection for the characters that she creates. D’Amour touches on a number of contemporary themes, including the credit crunch, unemployment, drug abuse and depression. But she skilfully uses numerous little comic touches and character foibles to lighten the mood of her play. Chicago drama critics commented favourably about the set that artistic director Kevin Depinet created for Detroit at the Steppenwolf Theatre. The stage included two realistically created neighbouring back-yards and, in the first act, a real onstage barbecue, complete with cooking smells. Detroit was nominated for the Pulitzer Prize for Drama in 2011 and was a finalist for the Susan Smith Blackburn Prize. The play received very positive reviews from the Chicago Tribune and Windy City Times, but the Chicago Stage Style was somewhat less enthusiastic. Recommending that readers should go to see the play, Time Out Chicago commented that ‘the tension ratchets up at a quirky but believably incremental rate’. Detroit the Musical has not launched in New York yet, so we are unable to do a review at this point. However, we expect this will be a very popular show. Bookings for the production of Detroit at Playwrights Horizons in New York can now be made. Tickets are available online or at the box office. Check online for dates and availability of Detroit musical tickets.